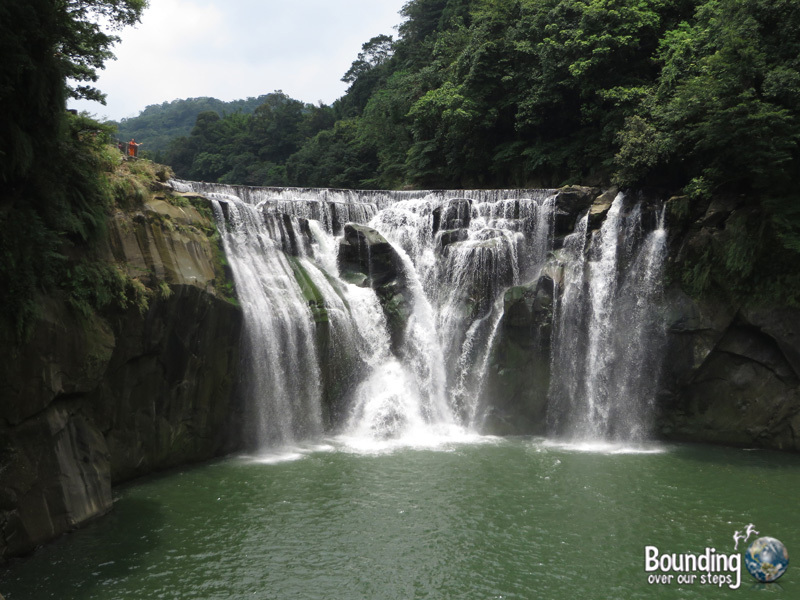 When looking up things to do in Taiwan, I came across Shifen Falls just outside the capital city of Taipei. 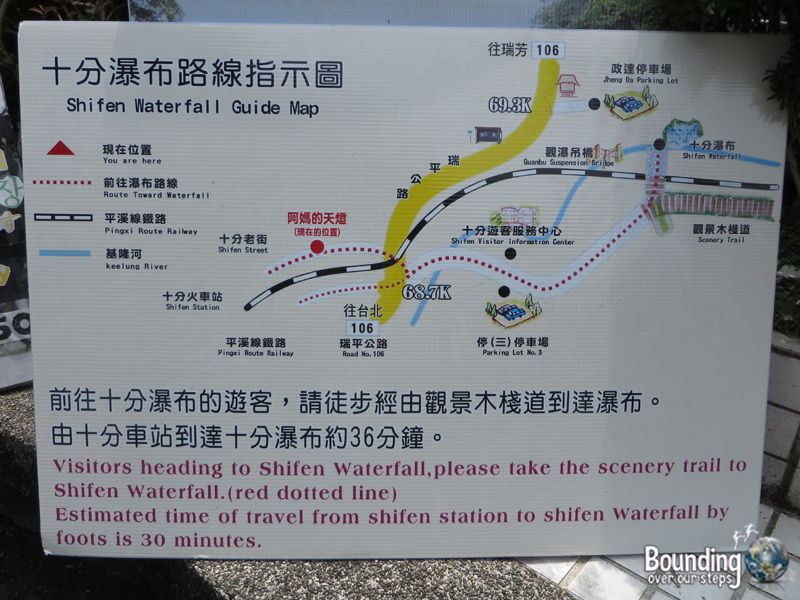 What struck me as especially interesting was that the Taiwanese often refer to Shifen Falls as a “mini Niagara Falls”. Mindy and I were married at Niagara Falls and so I found myself wanting to do my own comparison…or perhaps I just missed my wife. 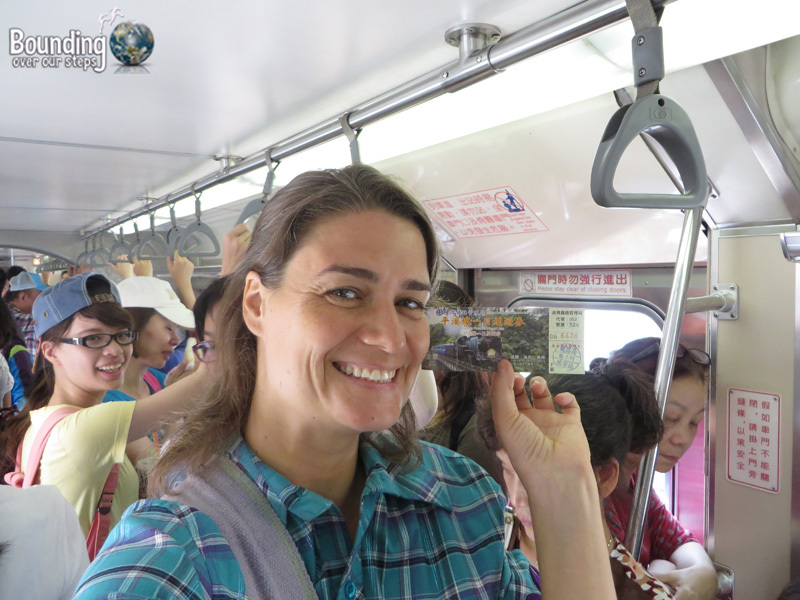 The adventure began at Taipei’s Main Station, where I boarded a train to Ruifang, about an hour away. 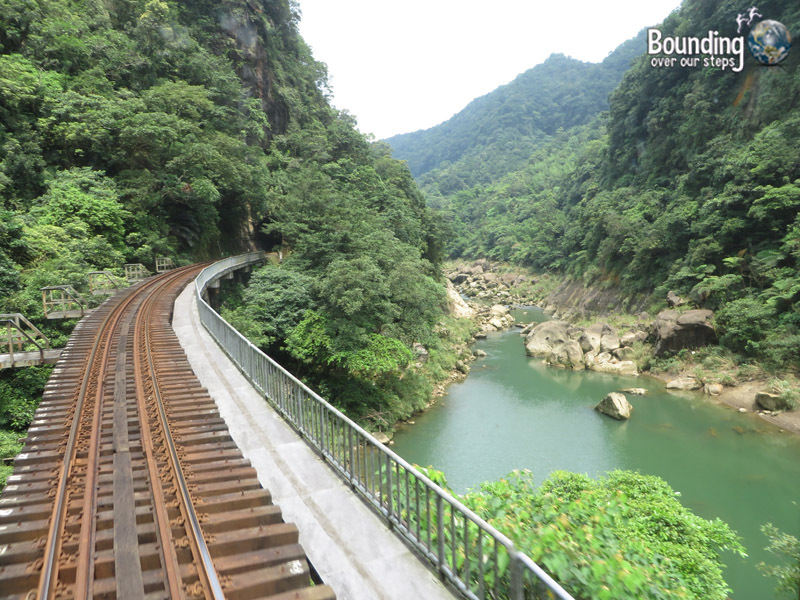 From there I bought a day pass on the Pingxi Historic Railway ($52 TD) of which the three most popular stops include Shifen, Ping Xi and Jintong. On the day of my adventure the train was packed with Taiwanese tourists enjoying their summer break and I was happy to be the only foreigner in the crowd. 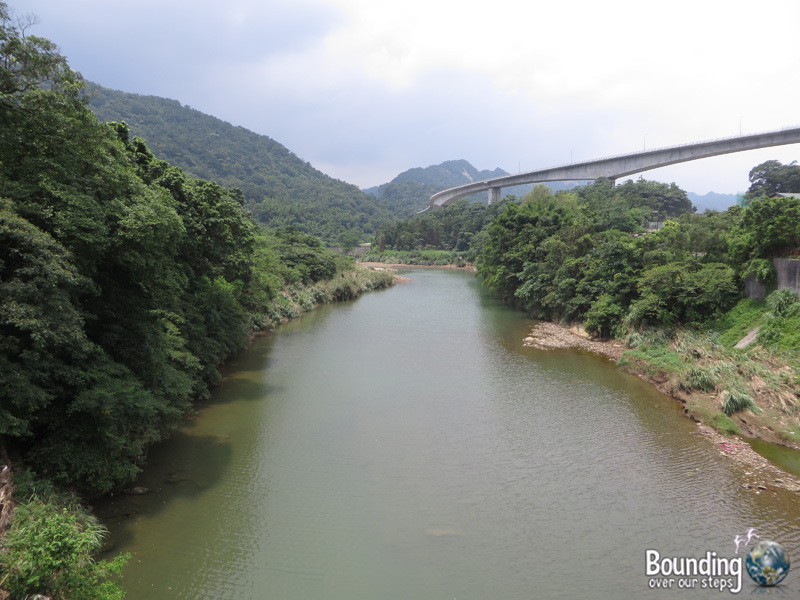 The train took us along the Keelung River through gorgeous countryside and luscious green jungle and about an hour later we arrived at Shifen Station. I knew I was in for a bit of a walk to get to the Shifen Falls but having no idea in which direction to go, I popped into one of the many shops along the train tracks near the station. I managed to get out “where is Shifen…”, but not knowing the Mandarin word for “falls”, I tried as best as I could to mimic water falling with my fingers. “Poo poo?” the woman asked me. Umm…if that means falls then yes, but if not I was apparently having a more awkward conversation than I had thought. I took a chance and the fact that instead of pointing to some back room in her store, she pointed outside and to the left, it became evident that “poo poo” was indeed the Mandarin word for “falls”. The way was not so clear and I ended up getting lost a couple of times, apparently crossing the tracks when I didn’t need to, but I am happy that I did. 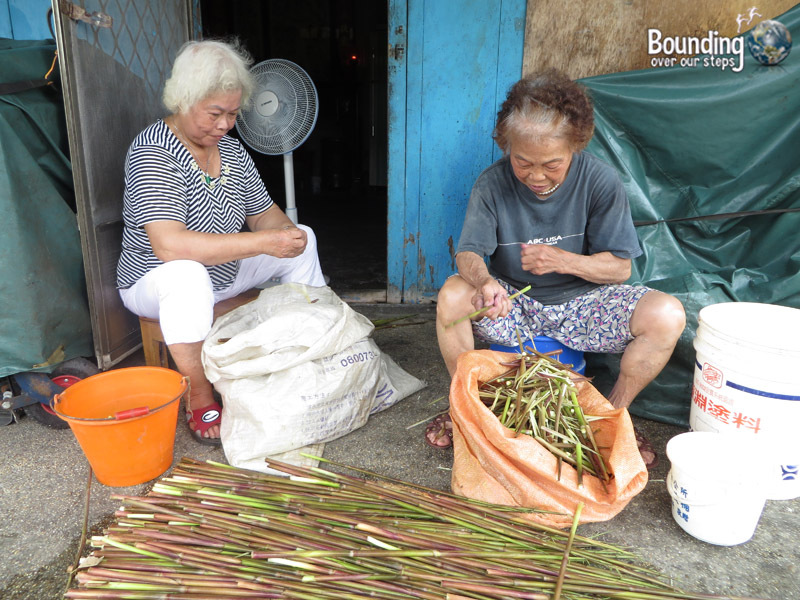 I got to walk through a small Taiwanese neighborhood and waved to everyone in their yards doing various activities or cleaning up. The adult in me asked people along the way where the falls were simply to practice my new Mandarin vocabulary, but the child in me just wanted to say “poo poo” over and over. After a group of teenagers, who were eager to practice their English, pointed me in the right direction, I made another mistake – I followed the signs for the cars which turned out to be a much longer route than taking the pedestrian way (which I did on the way back), including crossing a small bridge and walking next to the train tracks until coming to the entrance to the falls on the left. After finally making it to Shifen Falls, it was time to decide whether it does indeed resemble North America’s Niagara Falls. I made sure to visit all the vantage points before rendering my decision. The best and perhaps most photographed view was a short walk to the right once entering the park. So, then came the moment of truth: did I think Shifen Falls warranted the name “mini-Niagara Falls”? After photographing the falls I could definitely see reasons to justify the comparison to one of the world’s natural wonders. 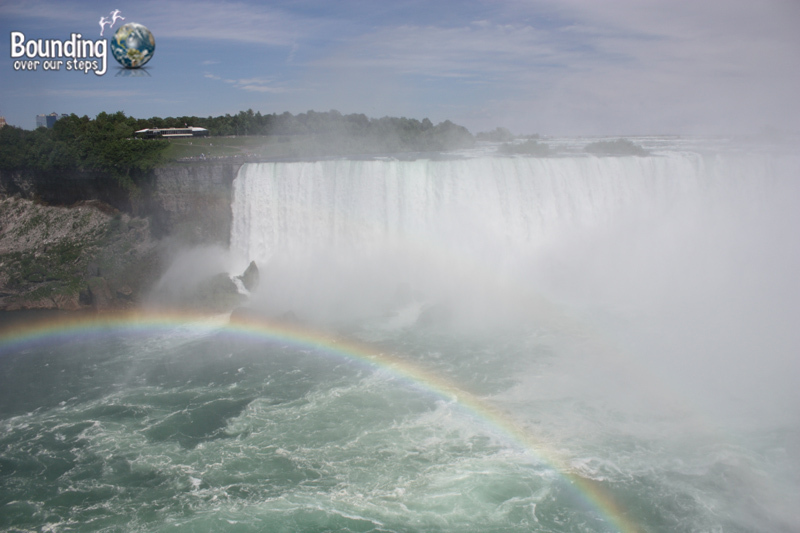 The curve at the top of the falls is reminiscent of Niagara’s horseshoe shape and the cool breeze coming off the falls reminded me of the strong wind at Niagara Falls that is created from the immense amount of water cascading below. 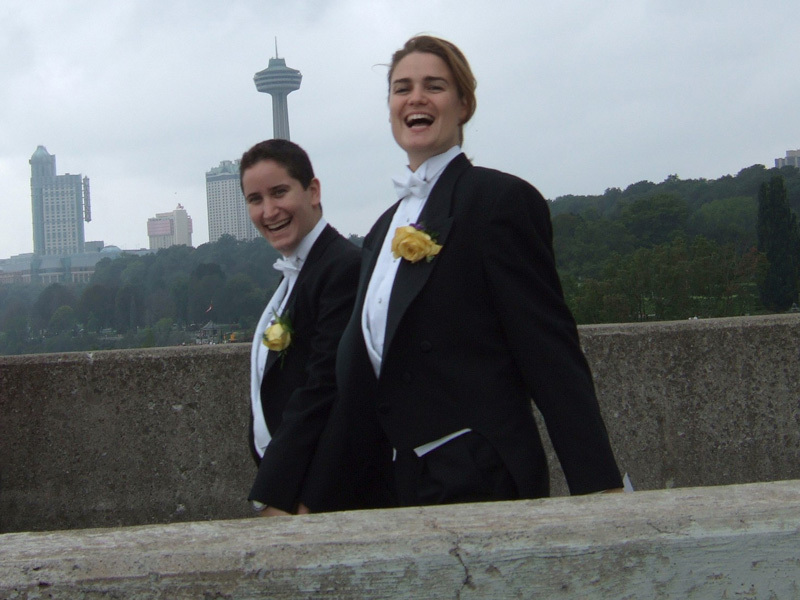 I thought of our wedding day at Willow Pond in the Botanical Gardens on the Canadian side and how the entire wedding party crossed the Rainbow Bridge into the United States to celebrate our union at the reception in Whirlpool State Park. What a fantastic day! When viewing Shifen Falls from the side, my mind flashed back to when I had proposed to Mindy at Terrapin Point on the New York side of Niagara Falls exactly a year before our wedding day. I remembered how my voice trembled as I read the text I had prepared explaining all the ways my life improved after meeting Mindy. I thought of being on one knee with the ring box opened and a tearful smile on my face. Standing next to Shifen Falls made me miss my wife more than I had during my entire time in Taipei. I came to accept that if Shifen Falls could evoke such strong and wonderful memories of Niagara Falls, then it does indeed deserve to be named “mini-Niagara Falls”. There are a few hiking trails that could last you several hours if you are up for a walk. 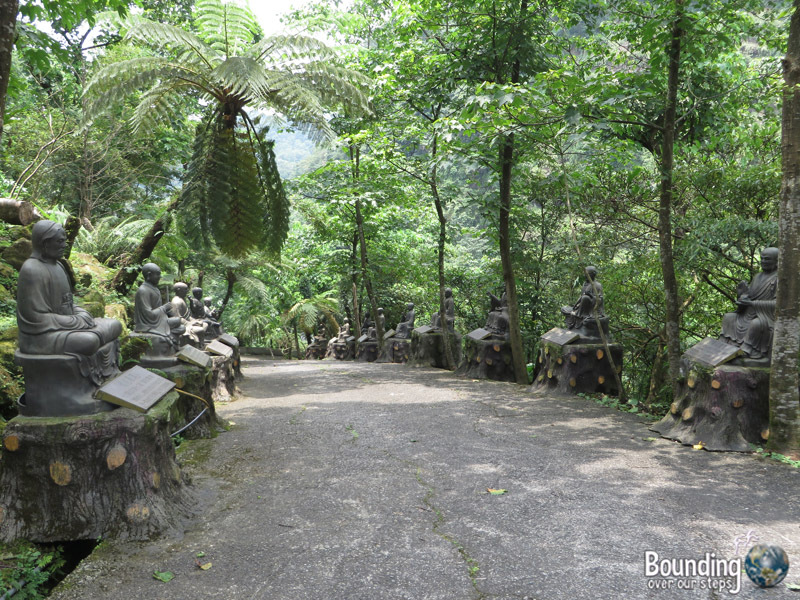 These pathways are steep and can become very slippery during the rainy season (June to October) so be prepared. There was food for sale, none of which was vegan, and the standard souvenir shop. I was not expecting to find animals in cages in the park, including goats, chickens and rabbits, one of which I very disturbingly had to report to management was dead. It is my hope that these animals have been removed and given a better home. 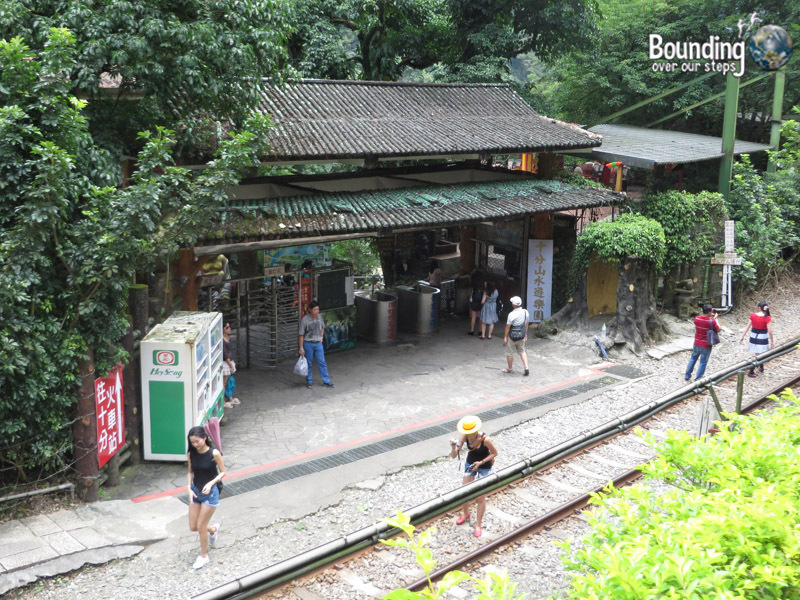 When you get off the train at Shifen Station, cross the tracks and turn right back the way the train just came. Continue to follow the tracks even when the rows of shops end and taxi drivers stop asking you if they can take you to the “poo poo”. You will walk under a very high bridge before coming to a train crossing. The road forks at this point and although either way will land you at the falls, the easier route is to the right. 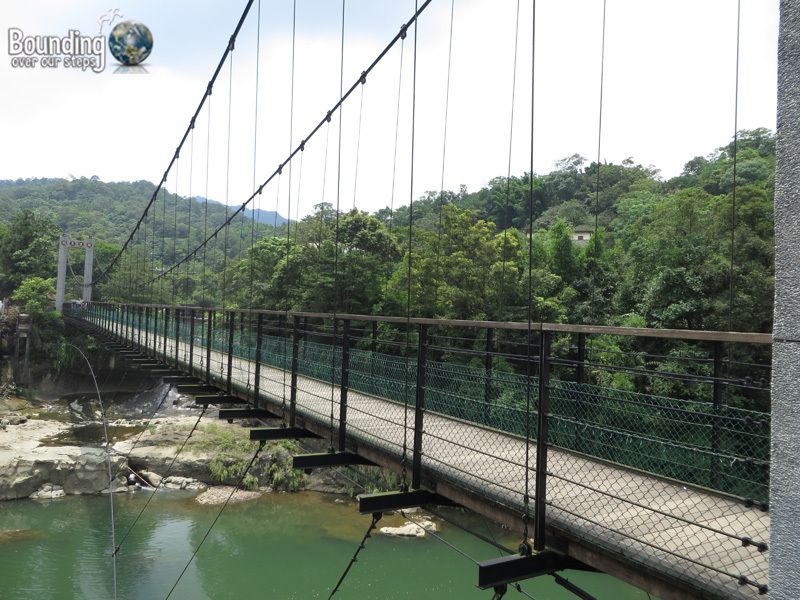 You will cross a wide bridge offering beautiful views of the panorama and after the bridge you will see a building to your left. There is a path there that will take you down many steps and lead you towards the pedestrian bridge – sometimes you can see the train passing on an adjacent bridge and can wave to passengers – and down some more steps to your right. Then walk along the train tracks until you arrive at the park on your left. There was an entrance fee when I visited in June 2014, but I have since read that as of December 2014, the entrance is free. 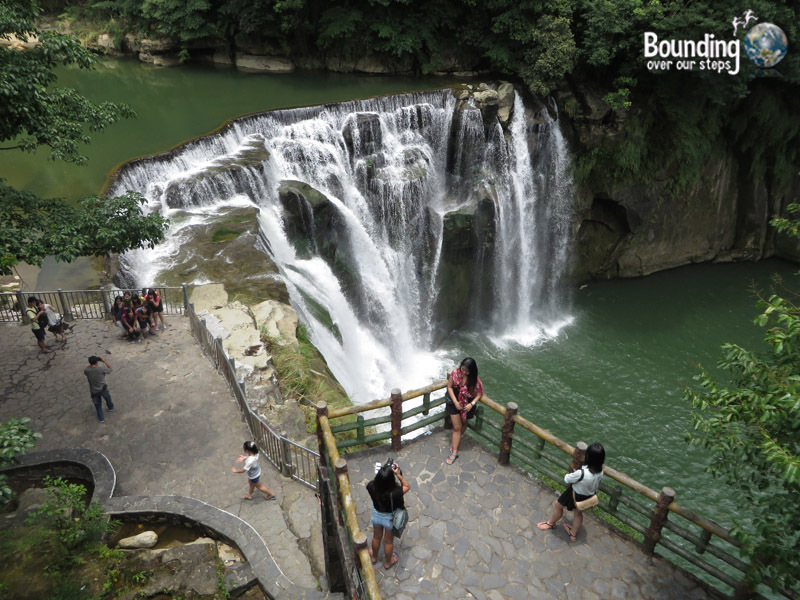 Do you think Shifen Falls resemble Niagara Falls? The waterfalls are beautiful, but a little dwarfed compared to Niagara Falls. LOVE LOVE LOVE. That wedding photo! I wants to go to Taiwan!!!!!!!!! I’m glad you are doing more posts on the country! Taiwan was amazing and was even much better than expected! SO much to see and do there and it’s easy to be a vegan in Taipei!